Atom Tickets, the social movie ticketing platform, is launching its first-ever national brand campaign. It debuts today (5/23) just in time for the summer movie season, with a national TV spot directed by filmmaker Peter Berg (Lone Survivor, Patriots Day) via Pony Show Entertainment and featuring actress Anna Faris. Titled “Anna’s Night Out,” the commercial shows movie fanatic Faris instigating a night at the movies via Atom. 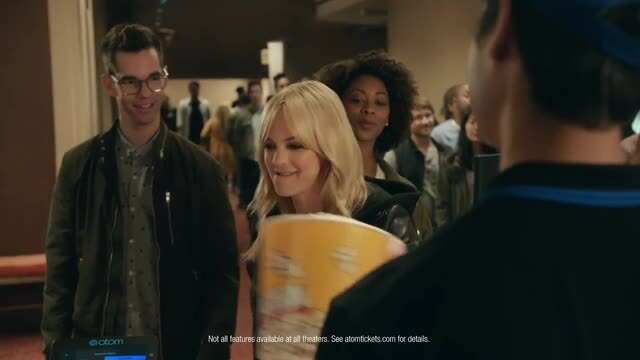 Using the app, she picks the movie, invites her friends, selects preferred seats and pre-orders a tub of popcorn, all while parodying memorable movie moments at each step of the experience. As the story unfolds, Atom’s benefits come to light, such as skipping box office and concession lines. The spot ends with Faris playfully scanning her Atom digital ticket to enter the theater, enjoying popcorn in her seat, and feeling thoroughly delighted by the Atom VIP experience. Client Atom Tickets Agency Deutsch Pete Favat, chief creative officer, North America; Janet Higdon, executive creative director; William Sawyer, Patricia Ortiz, associate creative directors; Vic Palumbo, director of production; Jesse Ferguson, sr. producer; Eryk Rich, music director; Chase Butters, music producer; Dez Davis, music coordinator. Production Pony Show Entertainment Peter Berg, director; Helga Gruber, executive producer; Gareth Wood, head of production. Editorial Whitehouse Los Angeles Heidi Black, editor; Joe Carugati, assistant editor; Joanna Manning, exec producer; Annie Maldonado, producer. VFX Carbon VFX Matthew McManus, exec producer; John Price, VFX artist. Postproduction/Color Carbon VFX Aubrey Woodiwiss, colorist. Music (Licensed and Original/Arranged) MassiveMusic, composer; Kiki McDaniel, exec producer; Tim Adams, creative director. Audio Post Mark Meyuhas, mixer; Peter Lapinski, assistant mixer; Susie Boyajan, exec producer.